Instead of oil can use butter or ghee for drizzling. for dosa batter: Soak 2 cups parboiled rice and 1/2 cup urad dal,1/2 tsp methi for 2 hrs in hotpack.Grind them to a smooth paste.Add salt.Ferment it for 8 hrs. Wash the leaves and drain it. Heat a kadai with 1 tsp oil.Add red chilli,hing,onion and saute till pinkish,add gongura leaves and saute it till it is cooked. Grind them with salt in the mixer to a smooth paste.Don't add water. Heat the tawa and grease with onion & oil.Pour the dosa batter from the centre and spread clockwise. Drizzle oil or ghee on all sides.Close it with the lid. Bottom will be turned golden brown and the top lis also cooked. Now apply the gongura paste and spread it all over the dosa. 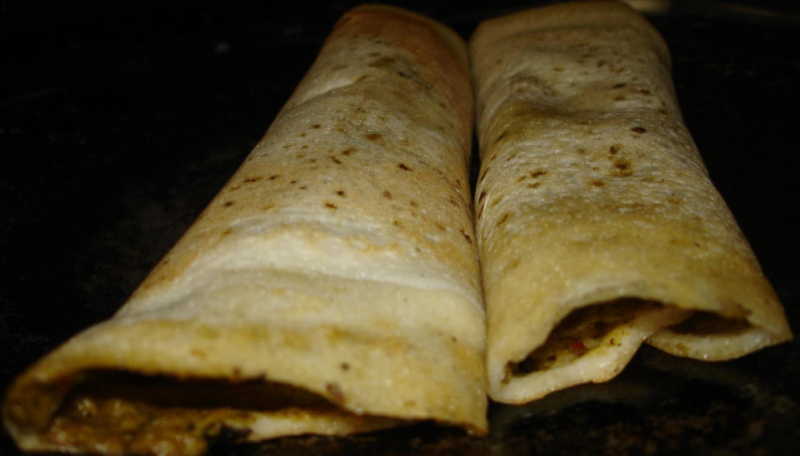 Roll the dosa or can fold first half and then again half.It looks like triangular shape. Serve hot.Onion raita is combination than chutney for this.